From the publisher's description: It’s 1994 and Adam, a drug addict from New York City, arrives at a kibbutz in Israel with a medieval sapphire brooch. To make up for a past crime, he needs to get the priceless heirloom to a woman his grandfather loved when he was a Holocaust refugee on the kibbutz fifty years earlier. You may have noticed that book reviews have become quite scarce here on The Relentless Reader. I have found that chatting about books on Twitter, Facebook, Instagram, and on The Socratic Salon to be a more fun and effective way for me to evangelize. But this book? This book won't leave my mind. The moment it arrived in the mail I was taken in by its looks. Do you see that cover? I know it's tawdry to be swayed by the outsides of something. I couldn't help it. The insides were just as lovely, thankfully. 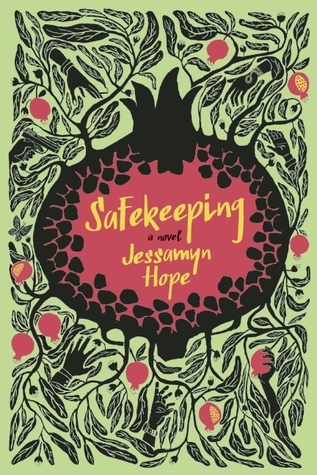 Safekeeping is filled with the things that I love most in books. The time period is one that is close to my heart, the characters are beautifully dangerous, and the setting is incredibly alive in Hope's hands. Hope has created a world, a story, a place that I want to go back to again. Now, I'm off to badger her on Twitter because I cannot get the ending out of my head. (Sequel, please??) And you? You're off to get your hands on a copy of this book. Oh -- this is one heck of an endorsement for a book -- going to try to grab it this weekend. Sounds awesome. I really hope that you do, Audra :D I loved it! A book that spurred a review from you?! I'm intrigued. This one looks so good. Great review. I get a lot of my TBR books from you! My evil plan is working...mauahahahahaha! ;) Thanks, Heather! Phew, that's a pretty cover! So glad to hear you found a book that you love so much (and always love reading a review from you!). Isn't it just the prettiest? The photo doesn't even do it justice. It's the kind you want to caress in person, lol. I was really intrigued by this one when you included the cover pic in a previous post; I can't say that I blame you, based on the cover alone! I'm so glad that it turned out to be a good one; I've added to my wish list!! It's a lovely story and the ending is STILL on my mind. :D I hope you're able to get your hands on a copy and that you enjoy it as much as I did. If you're willing to write a book review for it, it must be awesome! It does sound intriguing. Wow! Giving it the hard sell! I'll keep an eye out for it at the library, then. I guess I am :D It was the perfect book at the perfect time. I know how you've felt about reviews lately, so the fact that you're writing about this one makes me want it RIGHT NOW. This book sounds great! I also love the cover.